It’s true. You can’t talk about Greece these days without the mention of austerity measures, riots in Athens, political instability and the potential crash of the Euro. All of this has had a knock-on effect on the Greek tourism industry, as families are put off by negative news pictures showing growing social unrest, and the current trend for “staycations” means tourists are setting their sights on local drafty beaches rather than the blue-domed, white-washed panoramas of Greece’s formerly favoured island attractions. While Greece loses its tourists, and its economy dwindles further, the tourists lose the opportunity to enjoy an affable burst of Grecian spirit in their lives, denied their chance to indulge in the mediterranean smells of garlic and basil, mint and spinach, flakey pastry and syrupy dessert, thick rich yoghurt and fresh just-caught seafood. So while Greece finds itself thrown into yet a further bout of political and social uncertainty, I have chosen, as always, to look on the brighter side of life, taking it upon myself to celebrate the sunshine-imbued gastronomic culture for which Greece should be making headlines, and importing the tastes and smells of a warm mediterranean evening into my flat. As such, I have been cooking up a storm of Greek-inspired food in my flat here in gloomy London, and the results have been so good, I feel compelled to share the results. Most of the recipes are taken or adapted from Rick Stein’s Mediterranean Escapes (© Rick Stein 2007), but the cheese platter and stuffed squid dish are entirely my own creation (the chocolate fish is, sadly, so perfect as to be un-makeable – well, at least by my clumsy hands). 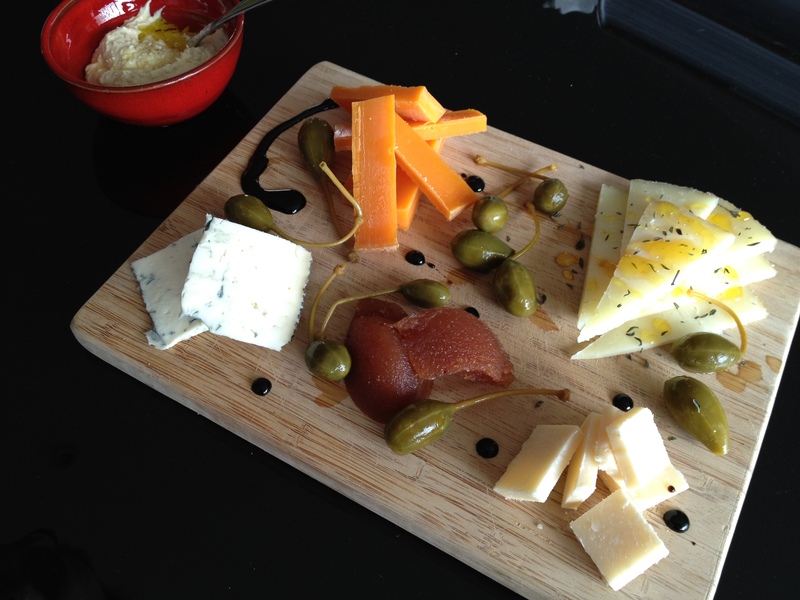 I started my greek food season (I should point out that i didn’t eat all of this at once – this was over a few days) with a light snack: a cheese platter with some greek (kefalotiri, halloumi and feta) and other mediterranean cheeses (there’s always space for my favourite Spanish cheese – manchego – drizzled with honey and sprinkled with thyme). With so many Greek cheeses out there you can go mad. I served my cheese board with a home made houmous sprinkled with sesame seeds, flat bread and rather large Greek capers, as well as a chicory, pomegranate and walnut salad. For a real taste of the mediterranean, you can’t go wrong with some simple, lightly fried squid, dusted in well-seasoned flour and shallow fried. The key is to leave the flour-coated squid for a couple of minutes before frying as the damp flour will give a crispier finish. Then you just need to shallow-fry the squid in oil (I use olive-oil for a more rich mediterranean flavour) for around a minute. I served the squid with a wedge of lemon and a smoked pimenton mayonnaise – simply make up a standard mayonnaise with a little extra lemon. Finely chop some garlic and crush into a smooth paste with the flat blade of a knife. Add this and a teaspoon of smoked pimenton to the mayo and you have the perfect dipping sauce for the squid. No mezze is complete without Greek favourite, Tzatziki, a cucumber and yoghurt dip perfect for eating with flat bread or pitta bread. 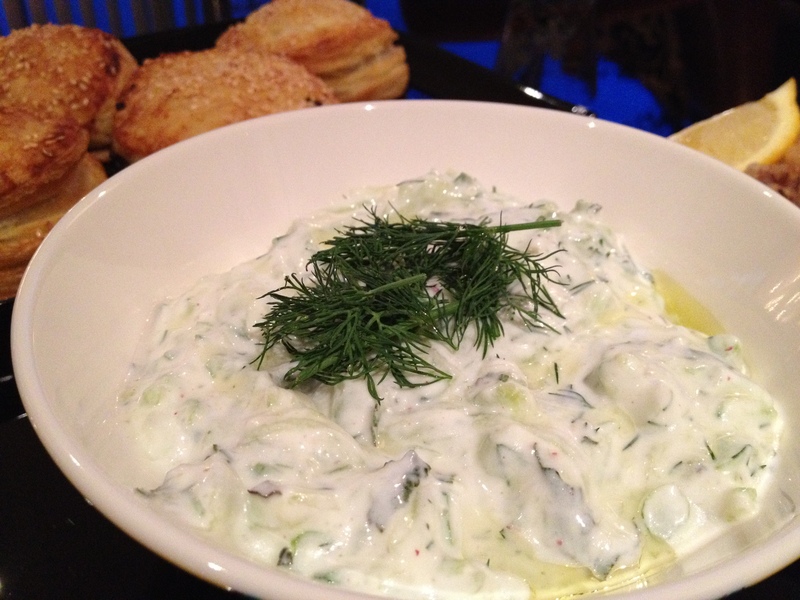 There are various pools of thought as to how to make Tzatziki. My Cypriot friend swears by yoghurt with oregano, where as others will use mint. Rick Stein recommends dill. And frankly all of these herbs work well. Personally I’m a lover of mint, but I couldn’t resist adding a little dill as well, and I found the Tzatziki lost nothing for this herb combination. So you need to take a cucumber which should be coarsely grated (you can peel off the skin if you like, although I generally leave it for texture). Squeeze most of the juice out of the cucumber in a (clean, obviously) tea towel and add to 500g Greek yoghurt, 75g of finely chopped spring onions, 2-3 heaped tablespoons of your chopped herbs (mint, dill, and/or oregano as preferred), 2 tablespoons of good quality olive oil, a teaspoon of white wine vinegar, seasoning and 1-2 crushed garlic cloves (be careful here – the raw garlic can be surprisingly overpowering in this dish. In my experience it’s best to start with one clove and add more if you like a pungent garlic flavour). Typical mezze will include a houmous as well as a tzatziki, but I decided to import a dish from Turkey to add variation to the typical hummus dish. Baba Ghanoush has a similar texture to houmous but with a predominant flavour of smoked aubergine which is delicious, especially when served sprinkled with pomegranate. To make the Baba Ghanoush, take three large aubergines, and pierce them near the stalk to prevent them from bursting. Place them under a grill for around 40 minutes until black on the outside and soft in the middle. Once cool enough to handle, cut the aubergines lengthways and scoop out the flesh. This should be mashed up with a masher or fork, or for those who like a smoother texture, whizz it in the food processor. Time to add 2-3 garlic cloves, crushed (again, be careful about adding too much – it’s best to start with one and keep testing), plenty of salt, 3 tablespoons of light tahini paste, a drizzle of olive oil and half a teaspoon of sesame seed oil, a squeeze of lemon juice and some parsely to garnish. 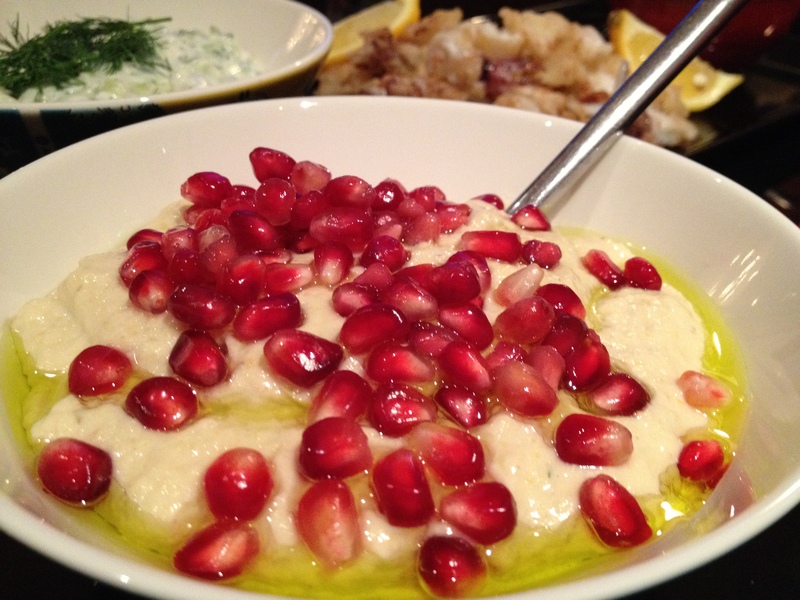 Serve with pomegranate and an extra drizzle of oil. I completed my mezze with standard greek favourites, spanakopita (I got over excited and forgot to photograph them). These are delicious crispy spinach and feta filled pastries and are wonderful when accompanied with the tzatziki or on their own. For the filling, sweat half a small onion and two finely chopped spring onions until soft. In a separate pan wilt 500g of spinach and press out the juices. Once cool, combine the spinach and sweated onions and add 100g of crumbled feta cheese, 1 large egg, 1 tablespoon of finely grated kefalotiri or parmesan cheese, a pinch of nutmeg, 2 -3 large tablespoons of fresh mint, and seasoning and mix well. For the pastry, buy a packet of pre-made filo pastry. Cut the stack of pastry into strips 7.5 cm wide. Brush the top layer with melted butter and place a heaped teaspoon of the spinach filling into the centre of one strip at the end nearest you. Then fold one bottom corner of the pastry diagonally over the filling so that the corner touches the opposite side to make a triangle. Then fold over the filled triangular corner, continuing to fold along the whole strip until a perfect triangular pastry is formed. Do the same for all the mixture. Brush the pastries with more butter (and, if you like, sprinkle with sesame seeds). Place on a lightly buttered baking tray and bake for 25 minutes at 180 degrees centigrade/ gas mark 4 until golden and crisp. I should note that you can make this recipe with puff pastry – I did it when I bought the wrong pastry and it was still delicious! 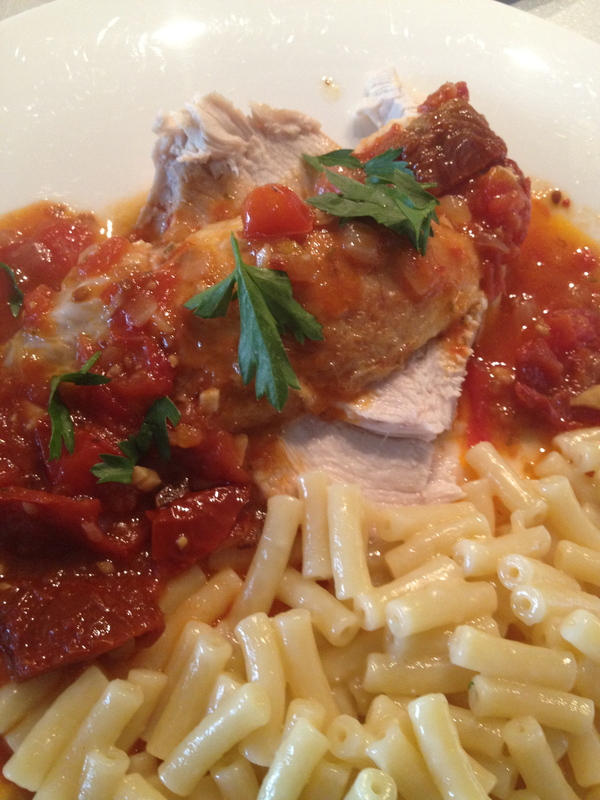 Next up an easy-cook chicken dish which imports the spices of the Aegean sea with a rich tomatoey mediterranean sauce. Simply take a whole chicken (around 2kg) and pan fry in a casserole for a few minutes on each side to brown. Remove the chicken and in the same pan gently brown a thinly sliced onion. Add 4 garlic cloves, thinly sliced, 60 g of sun-dried tomatoes, 500g of chopped vine tomatoes (or a tin of chopped tomatoes is fine), a cinnamon stick, 150ml of chicken stock, a generous pinch of dried chillies, 1 teaspoon of dried oregano and seasoning. Bring to a simmer and replace the chicken. Cover with a tight fitting lid and bake in the oven for 1.5 hours at 180 degrees celsius/ Gas Mark 4 and baste the chicken with the sauce every so often. Once the chicken is cooked and the juices run clear, lift the chicken onto a carving board and wrap in foil to keep warm. Then bring the tomato juices to a rapid simmer for around 10 minutes until slightly reduced and thickened. Remove the cinnamon stick and serve the tomato gravy in a generous flurry over the carved chicken. You’re meant to serve this dish with orzo (rice-shaped pasta) tossed in a handful of grated kefalotiri/ parmesan cheese, but since I couldn’t source any locally, I used macaroni – which worked surprisingly well! 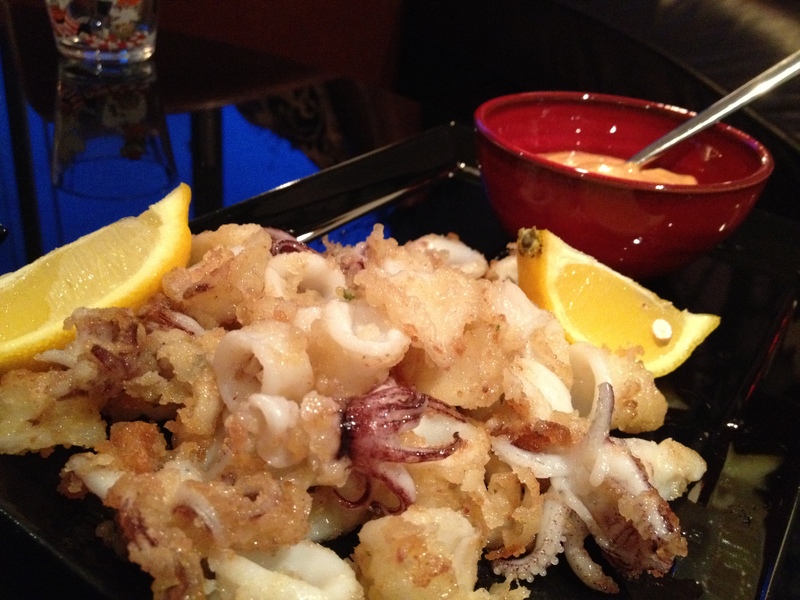 My final installment of Greek food was a stuffed squid dish which was an exercise in using up the contents of my fridge. I defrosted 6 frozen squids (they’re not currently in season) and stuffed them with a mixture of lightly toasted pine nuts, 50g or so of feta cheese, 50 g or so of mozarella cheese, a handful of basil, a good squeeze of lemon, some very finely chopped spanish chorizo sausage, seasoning and a lightly sauteed finely chopped shallot. I made a pesto-style paste from half the pine nuts by whizzing them in a food processor with the cheese and basil and added this to the gently friend chorizo and shallots along with the other half of the toasted pine nuts (I used a 100g bag in total). This made for a variety of textures. I stuffed each squid with the mixture and fastened the end shut with a toothpick for cooking. I then grilled the squid in a griddle pan for 2-3 minutes on each side. 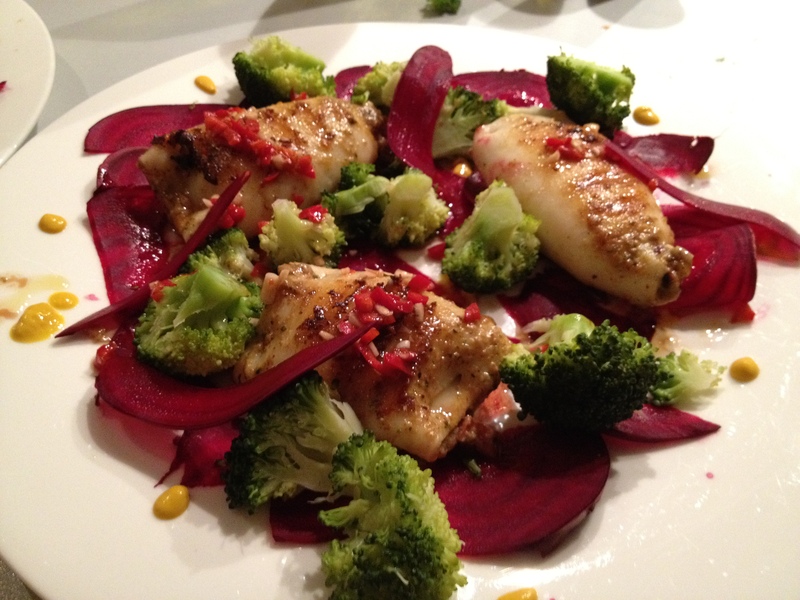 In the meantime I lightly steamed some broccoli and finely sliced a beautiful fresh raw beetroot which I scattered over the plate at random, along with a light dressing of chopped chilli, olive oil and a squeeze of lemon juice. I also dressed the plate with a few blobs of mustard for decoration and yet more flavour intensity. For dessert we ate something which has no remote connection to Greece whatsoever, but so beautiful was this chocolate fish which we gorged upon that he merits inclusion in this post. 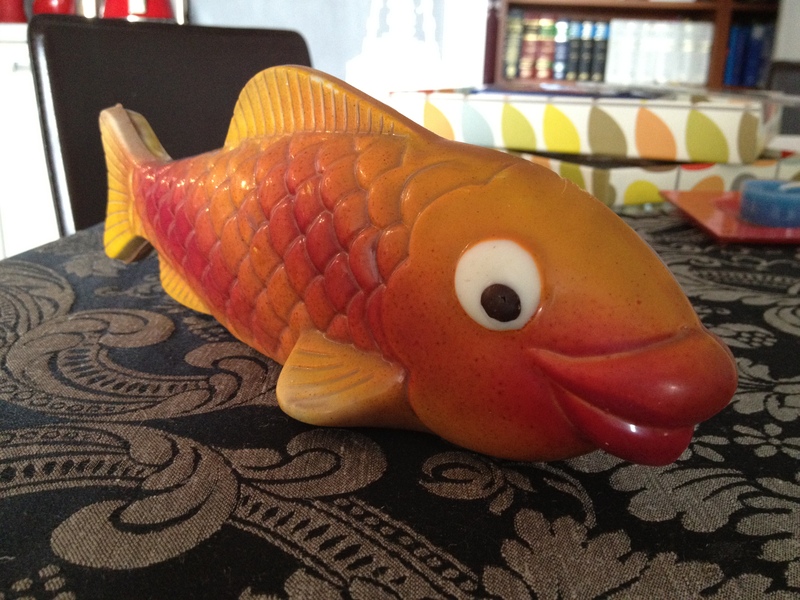 Bought in Salamanca, Spain a few weeks back, this fish is a chocolate beauty, so good that we resisted eating him for at least 3 weeks until finally succumbing to temptation last weekend. He tasted as good as he looked. I’m in Greece mode. It all started the other night when I was channel flicking in a desperate attempt not to go to bed which means the inevitable rise the following morning for work. 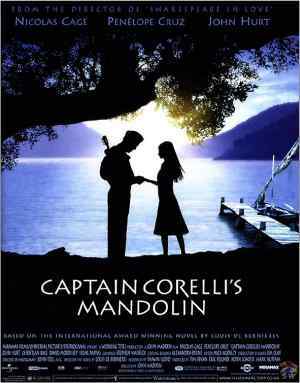 In the process, I staggered upon the film version of Captain Corelli’s Mandolin starring Nicholas Cage and Penelope Cruz and I was entranced. Despite having the film on DVD in my cabinet and having seen it at the cinema when it first came out, I’ve always dismissed the film to some extent because, like many other fans of the sensational Louis De Bernieres original novel, I was pretty upset about how much the film changed the charm, and crucially the ending of the book. I wasn’t best pleased about the casting of Cage as Captain Corelli either, who I had always imagined to be a short, rotund charismatic fellow. Nevertheless, when I caught a glimpse of the film, it entered my flat, descended with the rest of the UK into a renewed wintery gloom, with a much needed breath of fresh summery air. 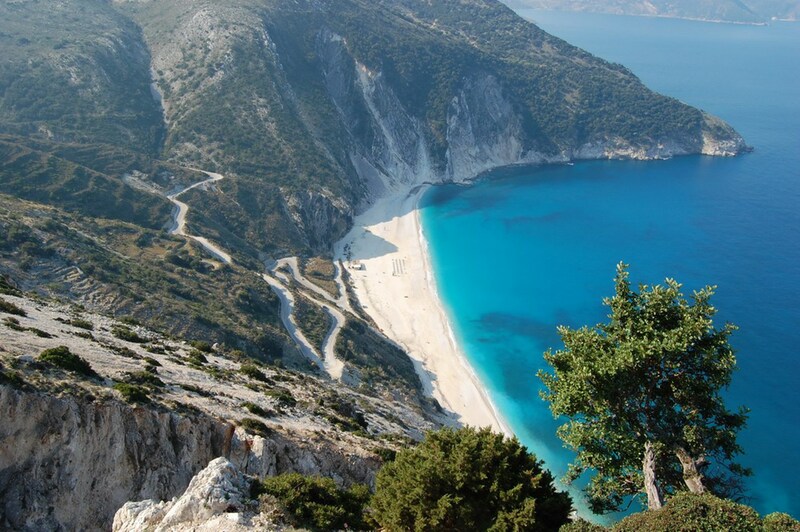 Who cannot be seduced by the stunning cinematography of the film which was set exclusively on the island of Cephalonia, as De Bernieres had intended. So all of this has sparked off a Greek revival in my flat. Greece has been getting a lot of bad press recently, what with financial disaster threatening to instigate a total collapse of the single European currency, and countless violent strikes and protests reacting against the suffocating austerity budgets imposed across the county. But while its coffers may be found wanting, what Greece does have is a wealth of cultural and historical richness which is almost unrivalled, not to mention a cluster of beautiful island destinations, each with their own individuality and incredibly picture-postcard views. I was lucky enough to visit the Greek islands twice during my gap year back in 2001/2, first piggybacking with my sister upon my parents’ wedding anniversary celebratory cruise around the Aegean Sea, and later in the year, joining two very good friends for a little island hopping around the Ionian Islands of which Cephalonia is one. While I would love to return to these gorgeous lands, where empty beaches and crystal clear waters can be found in their plenty, along side charming crumbling houses, and dry arid landscapes and mountain passes, I have in the meantime satisfied myself by grabbing the Captain Corelli DVD and watching the film through not once, but twice. I have also been cooking dish after dish of Greek treats (hopefully to be featured on my blog sometime this week) and now, for your viewing pleasure, I’m featuring two of the paintings I completed back in my gap year, at the ripe age of 18, when I first visited Greece on my parents’ anniversary cruise. 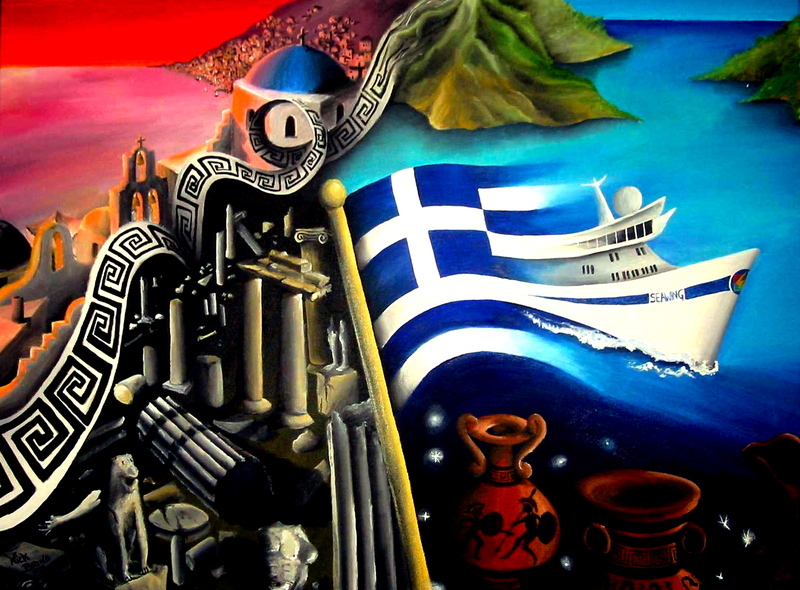 The first painting, Achean Adventure (2001), reflects not only upon the cruise liner, which can be seen emerging from the Greek flag, but also the antiquity which features predominantly across Greece (and which had a particular fascination for me having just completed my A-Level classics studies at the time) and the beautiful Grecian landscapes such as this one, of the island of Santorini. The second painting, Cruise Thru Cubes (2001) works like a multilayered exploration of our cruise around the Aegean Sea. Uncover various layers of the painting, and you see the cruise liner having docked and sailed in a variety of different destinations across the cruise, amongst them Mykonos (on the right) and Santorini (on the left). It’s good to give these paintings a good airing. Completed over ten years ago, they were some of my earliest painting attempts, and Achean Adventure was sold shortly after I painted it when it was first exhibited in Sussex.